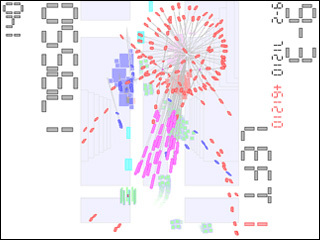 Noiz2sa is an abstract shooter game. Control your ship and avoid the barrage. A ship becomes slow while holding the slowdown key. A green star is the bonus item. A score of the item (displayed at the left-up corner) increases if you get items continuously.